I don't know how many readers we had, or what the response rate was, but I suspect both were low. Nonetheless, we authors had a good time. 1 July 2005, Alexandria, VA. Today was my first day in office as Institute Director for the North Central Region. Nothing went wrong today, and I am enjoying my term so far. My calendar is pretty much open today, so I’ll take a few minutes to recall some of the events that led to this momentous day. August 2004. CSI elections aren’t far off, and the North Central Region still doesn’t have a candidate for Professional Institute Director. Through most of my CSI career, I’ve been a lone wolf, preferring those activities that can be done at my convenience, and avoiding politics. After talking to several CSI friends who are current or past Institute directors, I am encouraged by their comments. They all tell me it’s a lot of work, but they also tell me it’s the most satisfying work they have done for CSI. A few reassure me about the politics, saying there really isn’t much to worry about. Taking strength from their encouragement, I call my region’s Institute directors, and tell them I am interested. 15 September. Today I learned that Gerard Capell, a friend from another chapter, is also in the race. 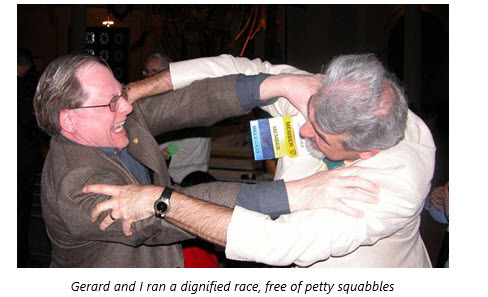 I met Gerard several years ago in Alexandria; while I was serving on the Institute technical committee, he was a member of the Institute certification committee. He had impressed me then with his work for CSI, and in the years since I had heard many good reports of his work for the Milwaukee chapter. In the last year, Gerard performed an amazing feat, leading four chapters in organizing a region conference in less than a year. ​Gerard’s interest in being the next Institute director posed an interesting question. Was I willing to run against someone I would otherwise vote for? We discussed the matter by phone and, as you might expect, concluded that we would remain friends and support each other’s efforts regardless of the outcome. And so, it was off to the races! 4 February 2005. After a friendly battle for office, the ballots are finally in the mail. One of our chapter members calls and tells me my name is not on the ballot. Not yet having seen one myself, I think, “That’s an interesting way to lose an election!” As it turns out, there are many defective ballots; we are assured that replacements will be issued, and the results will be valid. Next month: My first Institute Board meeting. I had hoped to return to the board this year, anticipating how much easier it would be without trying to work around a full-time job. However, unlike when I ran for Institute director in 2004, when no one was interested, several members were interested in serving this year. With the drive to get younger members involved, there isn't much room for septuagenarians, so I'll just continue on in my role as Curmudgeon at Large.